Isn’t this the question that is on everyone’s mind? With email marketing, everyone wants to know if they need to build a huge list or could they have a smaller, more intimate sized list. Size does matter in email marketing, but it isn’t the only thing that matters. The ultimate goal is to build huge email marketing lists full of quality customers and potential customers to expand your business. Your goal is to build a relationship with your customers to ensure your business is the first thought of when they require your products or services. But when you are just getting started, you want to find the balance between size and quality. You want to ensure that your list is large enough to be effective. You also want to have quality leads that are responsive and engaged with your email content. So who wants to generate more high quality leads that increase sales for your business? Because today, you will learn some great tips, strategies, software, and resources to help you grow your business with more leads and sales. Simply put, an email list for marketing purposes is a list of recipients likely to be interested in what you have to offer. A successful email marketing campaign backed by effective email lists can have a great return on investment for every dollar spent. The key to the success of such campaigns is to build an email marketing list that’s focused on the right recipients. The first tip for anyone who wishes to have an email list that’s going to produce real results is to avoid the temptation to buy lists. Resist the urge to purchase email lists for marketing. While naturally building an email list will take more time, the quality of a list like this will make a big difference when it comes to your ROI. Rather than purchasing email lists for marketing, email lists can be naturally created by reaching out to existing customers to create a list made up of people already interested in what you have to offer. Think of the emails you send out via your various email marketing lists as personalized sources of information. The process of receiving an email is, in itself, personal. After all, you’re going into someone’s “personal space” online known as their inbox. Email marketing lists are a content-driven form of engagement that can increase interactions with your brand. One of the most effective ways to steadily add new recipients to your email list is by using your content to encourage new sign-ups. Sprinkle your content with enticements to sign up for your email mailing list by clearly stating what recipients can expect to receive. Don’t forget about the email subject line. Make it attention-getting and relevant to what’s in your email to encourage people to actually open your emails once they sign up. With your blogs, the content of your posts can be used as initial enticement to generate interest. Offer readers of your blog to option to receive access to additional content in exchange for them signing up to receive your emails or email newsletters. An email list can be created with contests and giveaways with the payoff for you being more names on your email list. Sure, you’ll essentially be “bribing” people to fork over their email info, but it can be an effective way to create lists as long as you deliver relevant content. While you would think people who give email addresses up for giveaways and contests would just ignore future emails, this isn’t the case. In many instances, individuals who sign up for a contest or giveaway will actually check out what you have to offer. Above all else, email lists will be the heart of any email marketing campaign you may be planning. It’s important to have the right kind of list for your campaigns because email is more relevant today than ever before. The reason for this is the ability for recipients to easily view their email from their mobile devices, which makes it a highly effective form of engagement. And email use remains on the rise. Millennials, in particular, tend to pay attention to the emails they receive on their smartphones and other devices. Mobile devices alone can account for anywhere from 15 to 70 percent of all email opens, depending on the nature of the campaign and your intended audience. Once an email list is up and running, it can be an effective way to maintain customer relationships beyond purchasing. A successful email list is essentially an extension of your brand and another way of getting a message to your customers. It’s also not a standalone effort. Any email campaigns you run can be easily incorporated into your other online engagement efforts. For instance, an email campaign can be promoted via your social media platforms with a link that allows visitors to sign up to receive your emails. Conversely, you can drive your email recipients to your social media pages with links in your emails. Any email marketing list you use should be as customer-friendly as possible. And this means making it easy for recipients to opt out if they no longer wish to receive your emails. The last thing you want to do is irk customers who actually like your brand. However, you can minimize your unsubscribes by offering the option to receive your emails less frequently before they fully unsubscribe. The process of building email marketing lists isn’t something you have to do exclusively online. Email addresses can be collected in person during trade shows or even with customer satisfaction cards placed near the cash register. While these efforts may seem small, it can result in a list of names of people who actually want to hear from your business. And since email lists degrade about 22 percent each year, it’s equally essential to keep your lists updated. Next, let’s discuss some best practices. Email marketing can be highly effective for your business and branding. This give you an opportunity to really share and showcase what your business is all about. When you add these best practices into your email marketing, you will keep your customers happy and returning. One of the best email marketing best practices is to emphasize customer happiness. Shoving dozens of emails at your clients is one thing, but taking the time and effort to offer exclusives and incentives drive a prospering business. Squarespace, for example, offers reminders and uses different email campaigns to help their customers save by extending free trials. The best way to win over your customers through means of not actually seeing them is making them feel exclusive whenever you contact them. This way, they are much more likely to try a new product or contact your business back. One of the best email marketing tips you will ever hear is to add personal touches. By personalizing your company’s voice through your email campaigns, you can offer a more humanizing approach to your customers in their daily lives. Plenty of emails already sounds like recorded robotic phrases, time to spice it up and get unique with your marketing. Show your customers why it’s so much fun to shop at your brand. Email is one of the best forms of two-way communication online. Completely unlike TV or podcast ads that are one-sided, you have the chance to actually interact with those who see your campaigns. By accepting replies and feedback, you are already opening up your business to a more friendly tone that people will respond well to. You don’t even necessarily need to respond to every email. By simply saying that you accept replies and feedback show to your customers that your brand cares. This will drive your sales and foot traffic to your business. This is one of the best email marketing tips out there. By creative exclusive content or programs for your email subscribers, you can get them to feel good about connecting with your brand. Especially if you plan on developing a large email campaign, you want to make sure you have an audience ready to connect with the products you are unveiling. For your email marketing strategy, this is vital. Create a catchy subject line in your emails, along with engaging content that your customers will want to read. No one likes bland content that people will simply skim over, give your readers a purpose of reading your content so they will want to continue reading it! Creating a sense of urgency in your emails can work sometimes, but timely email will always leave an impression. You can use social trends and current events to your advantage when crafting your marketing emails. This is an easy way to encourage your email recipients to read your emails, as the value of them passes quickly. For example, every fall Starbucks offers a seasonal coffee, the Pumpkin Spice Latte. This drink is extremely popular with Starbucks customers. Starbucks also markets this drink well, putting extra emphasis on its limited availability. Greatist, a health and fitness website, took note of this social trend and the popularity of this drink. They saw it as an opportunity and gained their own buzz by providing healthier alternatives to the Pumpkin Spice Latte. Though this email is only relevant for a short period of time, it still gained a lot of views because of the popularity and urgency created by Starbucks. On the internet, everybody has a short attention span. Most people gets tons of emails every day and only skim them. If your main call to action falls beneath the fold, as many as 70% of your readers will not even see it. Additionally, it is a good practice to include your main call to action three times throughout each email. This is an important part of any email marketing strategy. Adding referral codes is a win-win-win situation for everyone involved. Your business wins as they are getting a sale and the referrer and referee win because of the exclusive promotion. Typically, referral codes are used by current customers in order to recruit new customers. Both parties will receive some sort of discount or offer for taking part in the referral program. As found by ReferralCandy, 83% of customers are generally willing to recommend a service or product they were satisfied with to a family member or friend. However, only 29% of people actually do refer the product. It is your job to motivate your customers to take part in your company’s referral program. Afterall, 92% of people say they trust the recommendation of trusted friends over advertising. This is an easy way to convert every email into an opportunity for a sale and makes converting readers into customers simple. According to the KISSmetrics blog, more than 70% of people say they read reviews before they decide to make a purchase. They also found that 63% of people were more likely to buy items from a website if it had product reviews and ratings on it. This is the reason why review websites like TripAdvisor and Yelp continue to succeed. Consumers like to know what other, experienced consumers think. The same idea can be applied in your email marketing plan. Incorporate testimonials, user reviews, and other favorable statistics in your regular emails. This is best when done subtly so as not to seem too braggadocious. A lot of forums and online communities advantage of social proof like this. It is an easy way to transform past sales and brand engagement into future ones. Put your email marketing best practices in effect and create auto response emails. It is a good idea to send out autoresponder email for those who recently opted in for your mailing list. Oftentimes people forget when they sign up for things like these, so these emails can serve as a good reminder. Set these emails to send out one day, five days, and 10 days after they register. To keep people from unsubscribing during this period, offer some sort of exclusive content or bonus material in these emails. This serves as a sort of reward for opting in to your mailing list. Now that we have covered some best practices, I want to share with you some great email marketing software that can help you grow your email lists. In recent years, LeadPages has surged to the front of name recognition in the area of email marketing software. If you haven’t heard it proclaimed before, the money is in the list. I’m talking about the email list. LeadPages is a one-stop solution that allows a user to create either landing pages or opt-in popup boxes, both of which are acknowledged as the leading ways to build your list. While skilled coders could create landing pages and popups from scratch, at some point, you have to wonder if it’s worth the time spent. Especially when you can build professional looking examples of both within the LeadPages dashboard in a short time. Marketers and business owners have come to realize that their time is valuable and paying a monthly fee to a service like LeadPages often makes good business sense. Unlike similar services, LeadPages does not offer a free 30-day trial, but will refund your first month’s payment at any time within the first 30 days if you aren’t satisfied. If you pay for a year at a time, the cost averages out to $25 month. Paying by the month moves that up to $37 for the standard plan, which is usually enough for those just starting out. There are more robust plans at higher price points if you need them. Start building awesome and simple pages today. Aweber has been one of the first names in email marketing software for a while now. Some would say it’s the best for bulk email as well. This company approaches the idea of collecting email addresses from a slightly different perspective than landing pages. Rather than offer landing page solutions, Aweber provides the resources to design your own opt-in form, which you can place on any web page. Aweber performs the behind the scenes work of collecting the email addresses of anyone who fills out the opt-in box. While similar services have gained popularity – MailChimp – is an example, Aweber enjoys the reputation among internet marketers as having a better delivery rate, which is critical when it comes to building an email list and marketing by email. 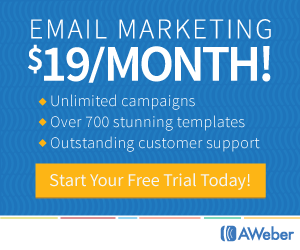 Is Aweber the best email marketing software? If you’re interested in giving Aweber a whirl, you should take advantage of the free 30-day trial. After that, the first level of service starts at $19 monthly for unlimited emails and up to 500 subscribers. As your list grows, you can move into higher cost/service tiered pricing plans. The good news is that LeadPages and Aweber have recently teamed up with an integration that allows subscribers collected from your landing page to be automatically added to your Aweber list. Start creating forms to collect email addresses today. This new-to-the-party service provider specializes in helping business owners create drip campaigns, which is just a fancy way of saying email sequences. This set-and-forget method of marketing is all the rage today. It works like this. You pre-write a series of email messages, targeted at segments of your list, and load them into an autoresponder. The emails a customer receives can change based on the actions the customer takes. Services like Drip do the heavy lifting of sending out emails at predetermined intervals. While some services like Infusionsoft do the same thing at a much higher price point (Up to $10k annually), Drip seeks to appeal to those with smaller budgets (and anyone looking to save money). Like any good email marketing package, Drip is set up with a simple dashboard that makes it easy to build forms within the content editor. Similar to Aweber, it can be configured to integrate with LeadPages and other prominent landing page vendors. Drip has gone to the trouble to make setting up and email campaign as easy as possible through the use of blueprints. Want to integrate a 5 week mini course? It is simple since many of the most popular options have already been set up and are ready to be turned on. All you have to do is provide your own content. You can take advantage of a free 30-day trial with Drip. If you like it, the first plan costs $41 monthly if you pay a year ahead, or $49 if you go month by month. There is a free option but it only allows for 100 subscribers and requires Drip branding to remain in place. Start building automated drip campaigns today. The final piece in your online marketing puzzle might be the most important when it comes to figuring out which campaigns are earning you money and which aren’t. Linktrackr might not fall squarely into the category of best email marketing software, but it is an online marketing tool that allows you to track the performance of your links in real time. This allows you to adjust campaigns on the fly. You can cut short the ones losing money and expand those making money. The bottom line is that internet marketers and business owners want to know exactly where their sales are coming from, and the sooner the better. Here is an amazing feature that you may have not considered. Imagine you have been promoting something for 6 months or more. Now, for some reason the link to the product has changed. Maybe you found a better product or the link just changed. Rather than going back to everywhere you promoted to change that link, you can just log into Linktrackr and change the destination of the tracking link. Then you are back up and running with updated links in a few minutes instead of wasting hours or days updating links individually everywhere you promoted. So what is this kind of link analysis worth to you? Linktrackr offers four different plans ranging in price from $9 to $69. The basic difference is in how many links you need to track. The Basic package allows for 100 while the Extreme level goes up to 5,000. The bottom line is that, regardless of which vendor you go with for your marketing solutions, you need a reliable way of tracking links. Start tracking your marketing efforts today. If you are new to email marketing and list building, this may seem a bit overwhelming. Once you setup a few campaigns, it will make more sense. Here is a basic diagram that shows you how the software connects together. You can also get a stronger grasp by attending the upcoming list-building webinar that I will discuss next. There is an upcoming webinar that will teach you how to generate more leads and sales for your brick and mortar, online, or work from home business. Where is the best place to buy email lists? How can I build my business email lists? How do I get more email list sign ups? Where can I buy a targeted email list? How can I build a bigger email list? Now, let’s look at what you will learn in this upcoming webinar to help you build larger email marketing lists. The Five Stages of the Conversion Journey. In order to turn more leads into customers, you have to understand the path taken by visitors to your website. They’ll break down each of the 5 stages of a marketing funnel, and show you 1 way you can strengthen each of them. Top List Building Strategies Revealed. Your #1 business asset in digital marketing is your email list. Convert more visitors into leads and you instantly boost your business. Learn their favorite “lead magnets” you can create in minutes, and the surprising places on your website to showcase them. Best Practices for Turning Your New Leads into Customers. Getting them on your email list is just the beginning. They will give you a 4-part email marketing campaign that entices them to buy. Optimize a “Forgotten” Page for More Traffic and Sales. Your website likely has 2 sorely neglected pages that are actually harming your conversions. They will show you how to turn 1 of those pages into a traffic generating and sales producing machine. Take the Tech Headaches out of the Picture. You no longer need to rely solely on webmasters and freelancers to put your conversion funnel into action. They will show you how the Leadpages software removes the tech hurdles so you (or anyone on your team) can create and publish beautiful, mobile responsive landing pages and pop-up forms in minutes. Answer Your Questions Live. This is not a pre-recorded training. Join Tim Paige live this Wednesday and he’ll answer your conversion funnel marketing questions throughout the presentation. If you want to build large email marketing lists for your business, don’t miss this webinar. It’s free to attend so make sure you register today, set a reminder, and attend. Now, you know about the upcoming webinar (and registered? ), let’s take a look at some additional resources that can help you grow your business. I believe I have shared a ton of valuable information with you, but I’m not quite done. Below are some free and paid resources you can use to improve your email marketing lists if you want to dive deeper. Get your free course and email templates now. Start your free email list building course now. Whew! This has been a long journey, but hopefully, you learned a lot and feel confident in building massive email marketing lists to increase leads and sales in your business. You are now armed with a ton of information, software, and resources to grow your business with email marketing. Remember, knowledge is useless without application so put all this great knowledge into action to build your email marketing list and grow your business.